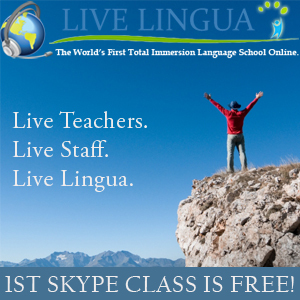 We have gathered together here a number of free language lessons and language courses for those learning languages, along with some other language resources, such as online courses and exercises, podcasts, video lessons, alphabets, dictionaries, lexicons, verb conjugations, language communities, newspapers, articles, and books. Most of these sites will be in English, although a number are multilingual in nature. Platiquemos, Fast Italian, and Baby Safari Downloads! The Internet has become an extensive treasure trove of information and content, and within this are a number of sites dedicated to learning foreign languages and the love of language. Interested in learning the finer points of grammar in French, Mandarin, Spanish, Portuguese, or German? Innumerable sites abound. Do you want to practice kanji, kana, Mandarin characters, pinyin, calligraphy, etc? Perhaps you'd like to hook up with an alternative language comunity, get an internet penpal in Japanese, converse online in Italian, ask for advice on matters Spanish? Maybe you want to browse some Korean newspapers, listen to internet radio in Russian? Or perhaps you want more advanced language texts, literature and poetry in the language of your choice, or historical sources on its development. Or maybe you just want to have fun: there are hundreds of crossword puzzles, games, quizzes, flashcards, and so on out there in the language of your interest. Maybe you are looking for dictionaries, character converters, grammar conjugators. All of these and more can be found on the Internet, for free! And so we have gathered together here a number of free language lessons and language courses for those learning various foreign languages, along with some other language resources, such as online foreign language newspapers, foreign language dictionaries, foreign language internet radio sites, and other sources relevant to the student of a foreign language. Most of these sites will be in English, although a number are multilingual in nature.